Offering a super-charged nutrient mix plus beneficial living microorganisms that promote rapid, fat-deposit-free growth and desirable form. Expect vivid and vibrant coloration. 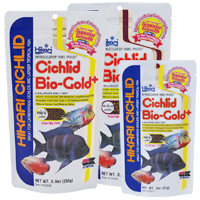 The use of premium-grade Fish Meal makes this perfect for omnivorous or carnivorous varieties. Suitable for all carnivorous African and American Cichlids.